Celebration of PRIDE month is an integral piece of the acceptance of the LGBTQ spectrum in New York. Through the month of June, we are privileged to see rainbow colored flags hanging in storefronts and excited crowds flood the streets to participate in the PRIDE parade. Zanele Muholi’s Pride & Loss, reminds us that there is still more work to be done in the world to make the LGBTQ community feel safe and accepted. In Muholi’s exhibition, she displays the resilience of the LGBTQ community in South Africa, a deadly environment for those who call it home. During a walkthrough of the exhibition, Muholi herself described this project as "visual activism", a way of bringing light to situations that are so often pushed under the rug. Muholi captures the essence of dignity that the LGBTQ+ spectrum displays in her homeland of South Africa, despite their constant fear of being murdered for merely existing. In South Africa, an estimated four out of ten LGBTQ citizens know of someone who was murdered for being or suspected of being LGBTQ. Despite this hostile environment, we get to see these courageous protestors take to the streets with their rainbow flags soaring in the air and attention grabbing signs fighting for equality within their own community. These photos of brave rebellion that exemplify the empowerment this community creates for themselves are juxtaposed by the devastating reality of the violence and homophobia in South Africa. Several photos are of funerals for those who have lost their lives for identifying as LGBTQ. However, even in these moments of grief, Muholi still depicts the bravery of these families who sit in multicolored chairs as a token of their solidarity to their loved ones. In Tutwini/ Condolences, a funeral service is proceeding for a fallen comrade in their community. But rather than the traditional black attire, the crowd is adorned in bright colors, a symbol of support for them. Many of the funerals portray a refusal to succumb to their world’s homophobia. 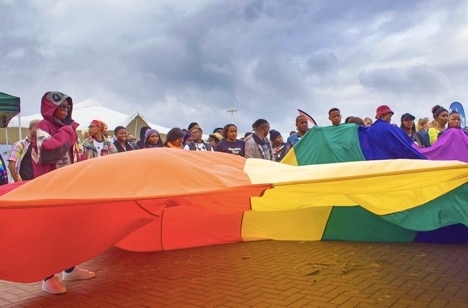 Whether it be through wearing rainbow- themed clothes or holding a PRIDE umbrella, they do not allow death to overshadow their loved ones’ stories. The lack of separation between photos of protestors and families grieving represents how the title terms of both pride and loss cannot be separated for the LGBTQ community. Their pride is laced with the perpetual fear that they too can become another victim to their country’s homophobia. In a short film, Muholi explains that she does not want to only depict the violence and hostility that comes with being in the LGBTQ community in her society. She says “I cannot continue to depict the brutality, because it can only bring more brutality. Her purpose was to show love, as it can project positivity and promote change amongst the community. Pride & Loss refuses to fight cruelty with anger, but with positivity in hopes of moving forward. Muholi herself embodies this theory during her walkthrough, as DJs play music loudly and people laugh and dance around her. As she moves jovially through the Jenkins Johnson Projects, it is a reminder of those of us who are privileged to be open about our sexualities and that there is still more work left to be done.